﻿TPWD to collect samples, consider movement rules to contain chronic wasting disease. 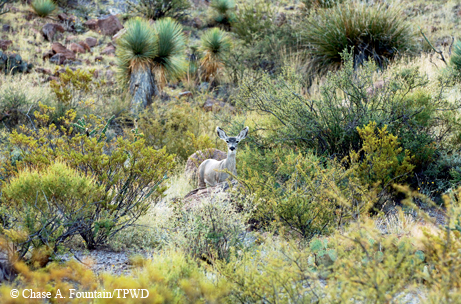 ﻿﻿﻿﻿﻿﻿﻿﻿﻿﻿﻿Wildlife officials are asking mule deer hunters and landowners in far West Texas to familiarize themselves with new protocols developed as part of Texas Parks and Wildlife Department’s response plan for chronic wasting disease. The plan includes mandatory check stations for mule deer killed in the CWD Containment Zone. The response plan is being implemented after tissue samples from two mule deer tested positive for CWD last summer. These are the first cases of CWD detected in Texas deer. Proposed rules restricting deer movement in the CWD-affected area of far West Texas will be considered at the Texas Parks and Wildlife Commission’s November meeting. CWD is a member of the group of diseases called transmissible spongiform encephalopathies. Other diseases in this group include scrapie in sheep, bovine spongiform encephalopathy (BSE or mad cow disease) in cattle and Cruetzfeldt-Jakob disease in humans. CWD among deer and related animals is a progressive, fatal disease that commonly results in altered behavior as a result of microscopic changes made to the brain of an affected animal. An animal may carry the disease for years without outward indication, but in the latter stages, signs may include listlessness, lowering of the head, weight loss, repetitive walking in set patterns and a lack of responsiveness. CWD is not known to affect humans. There is no vaccine or cure for CWD, but TPWD has taken steps to minimize the risk of the disease spreading from beyond the area where it currently exists. CWD workshops were held in October, and mandatory hunter check stations are being established. Proposed rules being considered would limit permitted deer movement into or out of areas in which CWD has been discovered as well as areas for which there is a possibility that the disease exists undetected. Officials will be collecting samples from hunter-harvested mule deer for CWD testing. All mule deer harvested in the CWD Containment Zone of El Paso, Hudspeth and Culberson counties during mule deer season, Nov. 23 through Dec. 9, will be inspected at mandatory hunter check stations and tested for CWD. Mandatory check stations will be set up at the Van Horn Convention Center and at May’s Café in Cornudas. Also, hunters in the surrounding High Risk Zone are encouraged to submit their deer for CWD testing at voluntary check stations in Bakersfield, Midland, Alpine and Sanderson, scheduled to be open during all three weekends of the general mule deer season. TPWD plans to post all test results on the agency’s website as soon as results are received from Texas A&M Veterinary Medical Diagnostic Laboratory. Additional information, including maps of the Containment Zone and High Risk Zone, check station locations and other details, is available at www.tpwd.state.tx.us/cwd. For more articles on hunting, check out TP&W magazine's Hunting Page.